About my Scandal-ous Night! : An Amazing Evening with ALL the Cast and Executive Producers of Scandal- Thursday, April 28, 2016. 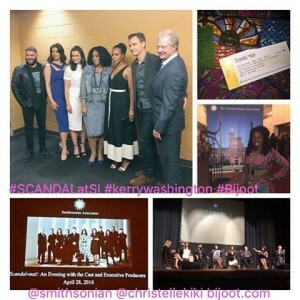 ‪#‎SCANDALatSI‬ Love seeing @kerrywashington in person with my @bijoot1 clutch/purse from ‪#‎LaJoieDeVivre‬ Collection at www.bijoot.com.